Doubloons are a secondary form of currency in the YPP world. The primary currency is PoE - Pieces of Eight. Doubloons are not used on Subscription Oceans, but players may purchase a subscription for 42 doubloons per month, a practice called coinscribing. Doubloons can be bought with US Dollars (Or by text message with any other currency), using all manner of payment types via the billing page. Types of payment include credit card, PayPal, mobile phone, prepaid cards (available at listed stores), money order and checks. The cost of a doubloon varies between about $0.25 to $0.20 per doubloon, depending on the volume of doubloons purchased. After payment is received, doubloons will be credited to the appropriate account. Depending on the payment method this may be automatic (in the case of credit card, PayPal, and redeemable codes), or may have to be done manually (in the case of money order and check payments). Payments using a credit card and Paypal can be made using the in-game "Get Doubloons" interface (in addition to the billing page), which can be reached from the doubloon exchange, or any cashbox. Doubloons are credited to accounts automatically, and should be received in a matter of minutes. Players who don't have a credit card can purchase Visa or MasterCard gift cards in US retail stores and use those to make purchases through the usual credit card payment method. Payments made using money order and check must be have to be manually added to accounts and are done as soon as possible after the payment is received. This could take up to a few working days. Note that when ordering doubloons via money order or check, the account name should be supplied and not the pirate name. If the doubloons are being purchased as a gift and the account name is unknown, the pirate name and ocean should be given and that this is the pirate name should be explicitly stated. All other payment types can be made through the billing page. As of August 2016, pirates can also purchase doubloons via Paymentwall methods (which includes bank transfer, ewallets, some mobile phone payment services, and PaySafeCards) and through the Steam system. Doubloons will be credited to the account once payment is received. Doubloons (or subscriptions) are not the only reward given to players for supporting Three Rings. First time purchases will ensure that the pirates on the purchaser's account will never be deleted for inactivity after approximately 6 weeks of not logging in. In addition to this, players will no longer see the 'Thanks for playing!' screen when they exit the client. 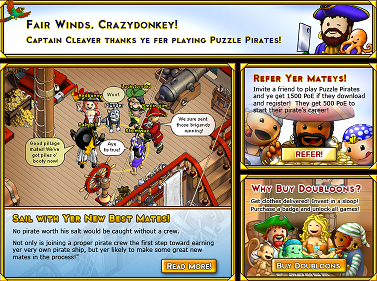 Depending on the amount of doubloons purchased, players may also receive Rogue Marks and a reward. - Official Three Rings billing page. Official:Pricing - details on how to make purchases with different payment methods. Doubloon Profit Calculator Helps calculate the profit to be made from a doubloon trade (online tool). Official FAQ for obtaining and spending Doubloons - Players must be logged into their account to buy Doubloons through the billing system using a credit card or Paypal. The list of current doubloon fees on Emerald, Jade, Meridian, Obsidian and Opal. WARNING: Palace shoppe items are missing and some prices are for items that have yet to be introduced to the game. This page was last modified on 17 February 2018, at 19:12.